Working on the propane conversion of my gas stove. One of the orifices to be changed is in a very hard to access location - shown in the photo. 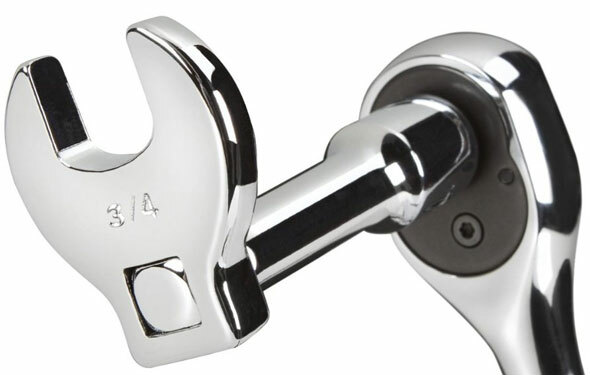 The orifice is the "nut" I'm referring to, which you can fit a wrench onto. Although it is possible to get a wrench on it there is a very limited range of motion due to surrounding apparatus. I've tried to mark this in the photo with the red lines. 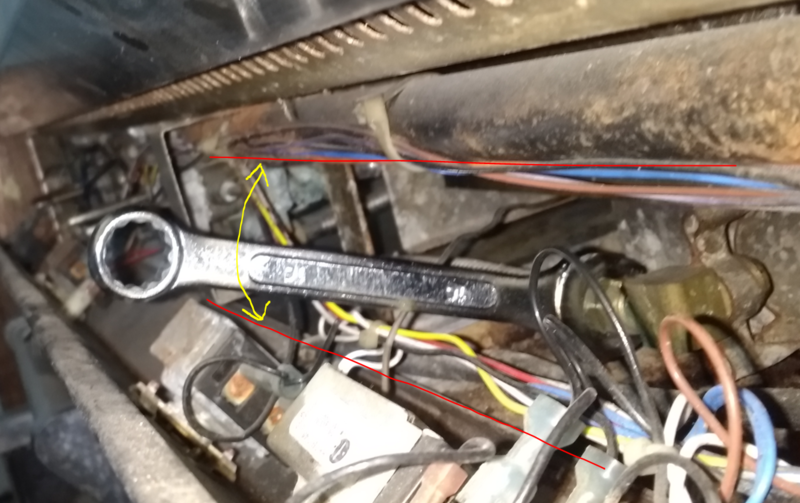 The very short arc that the wrench can turn in means that it never gets a 'bite' on the orifice / nut and I can't even loosen it. It would be much more work to disassemble the other parts in this area, so I'm hoping for a solution to remove and then reinstall just the orifice part. Maybe there's a specialty type of wrench... or something else I'm not thinking of. These are amazing and are designed to avoid stripping and marring. 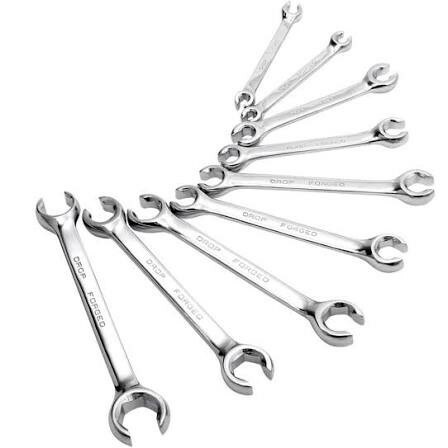 The best tool I have found for the type of application you are working with is a 12-point split-box wrench. These are also available in a 6-point design. The split end lets the wrench get onto a fitting even when a tubing is inline. The box construction also gets better grip on the fitting than trying to use a conventional open ended flat sided wrench. The 12-point design and ability to flip the wrench over if needed from stroke to stroke makes this the tool of choice if the working angle to the fitting is small. 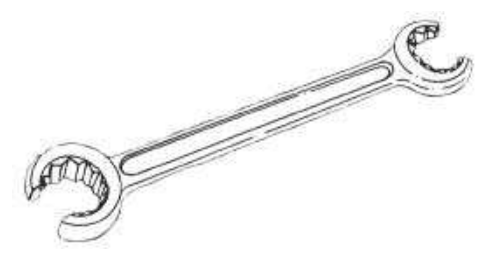 What you may be overlooking, or what may not be present on your wrench, is the the open wrench is not square to the shaft. It is canted by 1/24 of a circle (15 degrees). As a result, there's a 30 degree difference between the wrench (normal) and (flipped). That means you only need a 30 degree arc of motion, not a 60 degree arc. When you run out of travel, remove the wrench, flip it over, raise it 1/12 of a circle (30 degrees), and it will fit on the next flat. 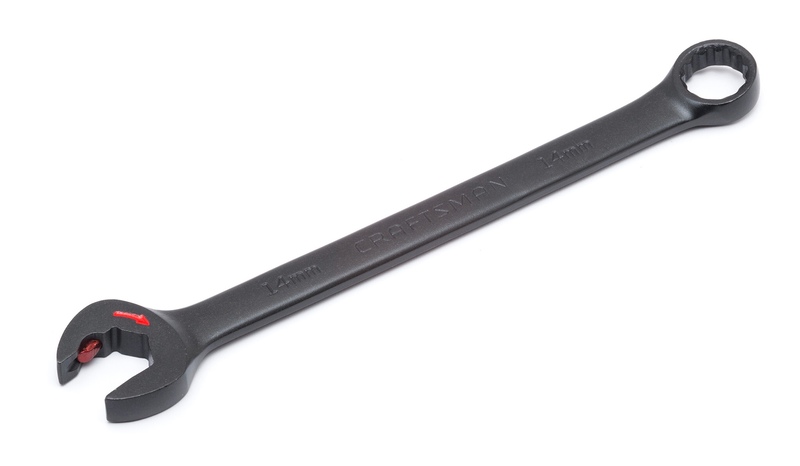 If your range of motion is being compromised by the wrench being all loosy-goosey on the nut (that's a technical term), then you have the wrong size wrench. Do not proceed further because you'll damage the hex corners, which will make the lash problem much worse. In particular, watch out for English vs. Metric. The only wrench sizes that match up are 3/4=19mm, all others will be sloppy. 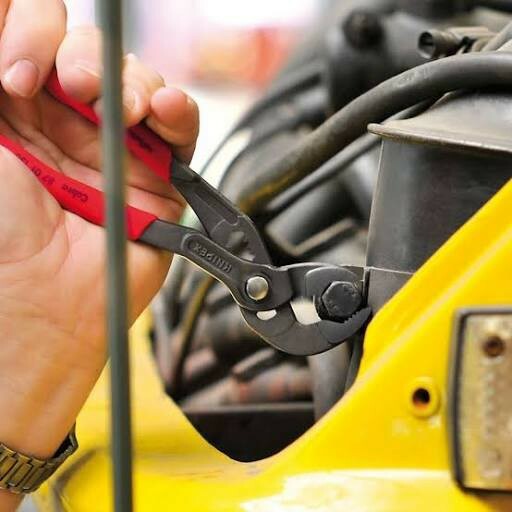 An adjustable wrench (commonly called a 'monkey wrench', inaccurately) is one answer, but you have to get that tight and might have to retighten on every turn. An open end Ratchet wrench is likely the best tool for this job. Mind you, the set cost me quite a bit... But that was a long time ago. EDIT this won't work because in this instance the fastener is obstructed by a pipe. Leaving for completeness. There appears to be plenty of width to the slot. 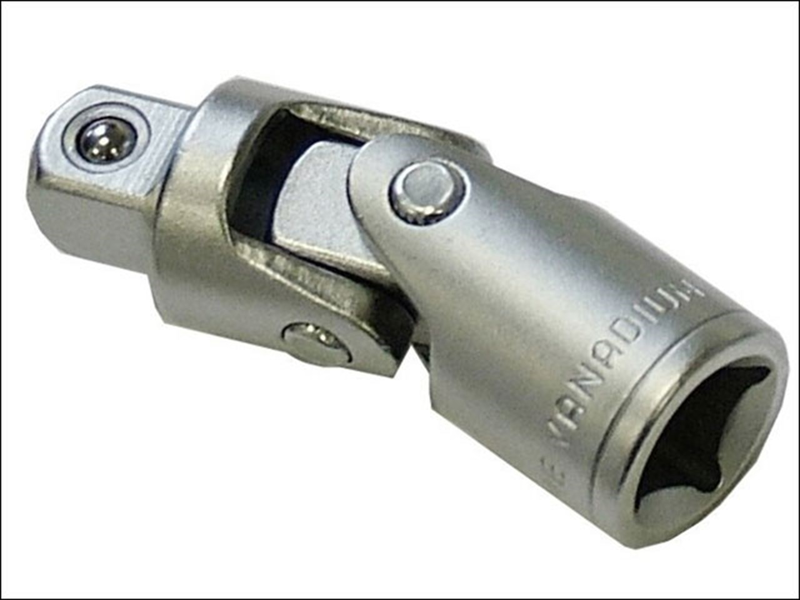 How about a socket with a long extension bar and a universal joint? They add slop but that's no more than annoying. You'd require a deep socket to go over any bolt too. Before anybody points this out: ratchet mechanisms are "weak". They do not allow one to exert really high torque, and tend to fail if you try to dislodge a really stubborn nut, for example by bashing the handle with a hammer. If this is a problem, start with a standard wrench to loosen the nut a little. Then switch to the ratchet. I suggest the wrench is the wrong size for a perfect fit on the nut. Plumbing fittings are commonly made in their own peculiar series of sizes. Just a little misfit at the nut becomes a large loss-of-movement at the handle. Suggest you explore the fit. If it is desperate, you might be able to shim the wrench for a neat fit on the nut. Not the answer you're looking for? Browse other questions tagged tools bolts wrench or ask your own question. Should a washer go on nut side, or the bolt side? How can I hold a nut underneath a deck with no clearance while screwing a bolt into it? What tool to tighten this nut?